Genuine amethyst chips and mother of pearl combine with the shimmering shine of clear glass beads and polished purple glass rounds to create a cascade of color in this beautiful handcrafted cluster bracelet. 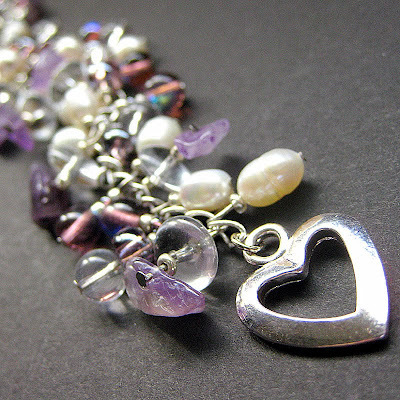 The entire piece is then finished off with a silver plated heart-shaped toggle clasp and matching chain. I personally love this style of bracelet. The sound it makes when worn is soothing to the senses.